1971 held at Satellite Beach, Florida. The Ft. Lauderdale Gators, behind Tournament MVP Donna Phillips 4 for 4 game, beat the Hialeah Dots 11-10 in the winners bracket final. The Dots led 8-1, but the Gators came back and won on Phillip’s base hit that drove in the tying and winning runs. The Dots then defeated the Springfield Robinettes in the losers bracket final and got another crack at the Gators for the Championship. Once again, the Gators, behind the pitching of Louise Crocco and Donna Phillips clutch RBIs won final game 2-1. Chris Padgett (.464) and Sandy Hamilton (.480) led the offense for the Dots. Long Island’s Sue Taylor had a monster tournament winning both the Home Run and Batting championship. This league was the idea of Detroit’s Ed Dreslinski, who invested a large amount of his own money and also procured corporate sponsors such as Coca-Cola, American Tobacco Company and General Motors to take care of transportation costs. All lodging would be taken care of through a deal with Holiday Inn. Each player was insured for $200,000. The league would have 8 teams in the league and play a 28 game schedule. The league would use a Red, White and Blue Softball. available on the winner. The league started with 8 teams and soon thereafter, 2 teams dropped out leaving 6 left. These are the records I could locate. Little Caesars of Detroit was 25-3 on August 8th, they defeated County Sports of NY 13-9 to clinch the League Title. Bob Auten and Bill Cole both hit 3-run HRs to lead the way. There was no playoff. 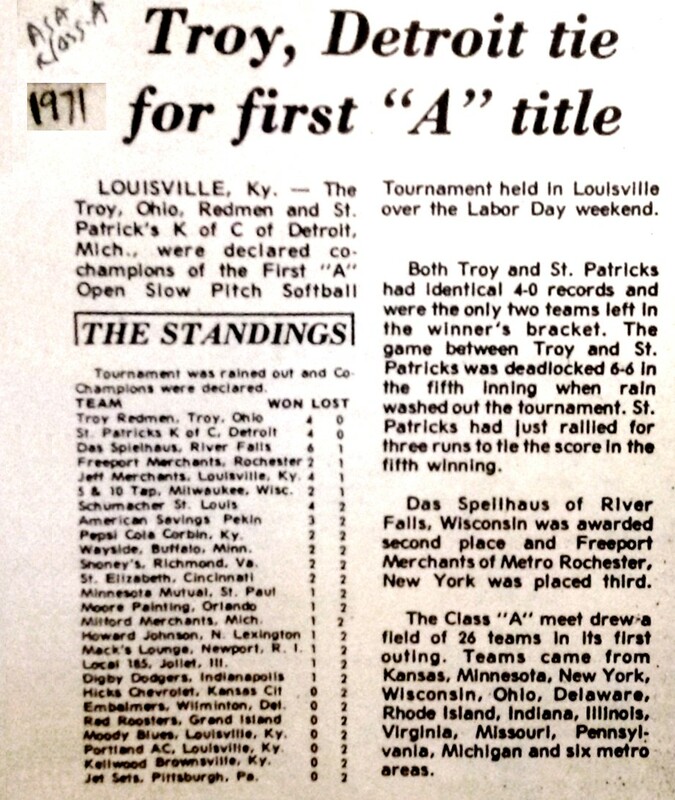 1971 held at Louisville, Kentucky. This was the first year of the ASA A Men’s Slow Pitch National Championships. 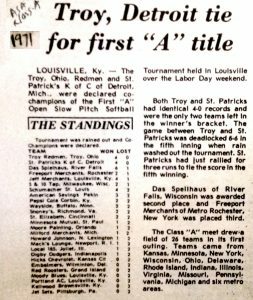 The Troy, Ohio, Redmen and St Patrick’s K of C of Detroit, Mich were declared co-champions of the first “A” Open Slow Pitch Softball Tournament held in Louisville over the Labor Day weekend. Both Troy and St. Patrick’s had identical 4-0 records and were the only two teams left in the winner’s bracket. The game between Troy and St. Patrick, was deadlocked 6-6 In the fifth Inning when rain washed out the tournament. St. Patrick’s had just rallied for three runs to tie the score In the fifth winning. Das Spellhaus of River Fells, Wisconsin was awarded second place and Freeport Merchants of Metro Rochester, New York was placed third. The Class “A” meet drew-a field of 26 teams In Its first outing. Teams came from Kansas, Minnesota, New York, Wisconsin, Ohio, Delaware, Rhode Island, Indiana, Illinois, Virginia, Missouri, Pennsylvania, Michigan and six metro areas. The winners bracket final between Troy Redmen and St. Patricks was tied 6-6 in the fifth inning when torrential rains came and washed away the rest of the tournament. Troy and St. Pats were awarded Co-Champs and Des Speilhaus of Wisconsin and Fairport Merchants of Rochester third and fourth respectively. Both were alive in the losers bracket. Jefferson County Merchants and 5&10 Tap were awarded 5th and 6th as they were still alive as well, but did not advance as far as the other two teams with one loss. Also, Fairport Merchants defeated Jefferson County head-to-head. In the final few games played: Winner’s bracket – Fairport Merchants defeated Jefferson County Merchants 4-1. Troy Redmen defeated Fairport Merchants 15-5. St. Patricks K of C defeated Milwaukee 5&10 Tap 10-3. In Loser’s Bracket games; Des Speilhaus eliminated Schumachers 12-4. Jefferson Merchants eliminated Corbin Pepsi Cola. 1971 held at York, Pennsylvania on August 1-9. Accurate Welding was 75-22 on the season. They also played Little Caesars in a USSSA vs ASA match of champions. Playing by ASA rules, Accurate emerged victorious 14-13. Accurate shocked USSSA people by how dominating they really were in the series. They collected 68 hits total in the four games, including 5 HRs on the big 300′ fences. They outscored their opponent by a 45-10 margin. Game 1 – Accurate Welding 17 vs. Goettl’s Metals 3 – Accurate had 25 hits. Jim Mortl was 4-4, Carl Bruce (HR), Jim Warras (HR) and John Wegner had 3 each. Game 2 – Accurate Welding 13 vs. Goettl’s Metals 0- Accurate dominated again with 22 hits. Jim Mortl, John Wegner and Gary Perkins had 3 hits apiece. Game 3 – Accurate Welding 8 vs. Goettl’s Metals 1 – Accurate had only 11 hits, but still managed to emerge victorious. Jim Mortl led Accurate with 2 hits. Game 4 – Accurate Welding 7 vs. Goettl’s Metals 6 – Goettl’s scored 5 runs in the 5th inning to take a 6-5 lead. Carl Bruce of Accurate hit a 2-run homer to win it 7-6. Accurate defeated Ace Movers 12-4 in the winner’s bracket finals on the strength of home runs from Carl Bruce and John Wegner. Ace came back to score a couple on run scoring doubles off the bats of John Gross and Willie May. John Wegner hit his second HR of the game and Darryl Greenmeier’s triple put the game out of reach. Accurate defeated Fairdale AC of KY 13-1 and Feldotts of IL 8-5 to reach the final. Ace defeated 6th Ward of Pittsburgh 22-7 and the Iron Dukes of New Castle PA 5-4 to gain their final berth. The Milwaukee Commandos (Robert’s Lounge) were playing the powerful Hicksville Astros of NY in the loser’s bracket. Hicksville was leading 1-0 when it started to rain hard. After 6 hours of rain, it was called and Accurate declared the champ, with Ace second and Hicksville awarded third and the Commandos fourth. Big Apple won five straight games to win the Western Worlds. All were close games as they beat in order; Bemco 5-2, VB Morgan Trucking 6-4, Kerr’s Sporting Goods 4-3 and Glenwood Motors 5-3. In the Championship, they defeated Berg Ford 9-3. Weekes earlier, Berg defeated Big Apple to win the Arizona USSSA State Championship. Berg also played a series of close games to reach the title game. They won 10-9 over the Carpetbaggers, 6-3 over Bit of Italy, both from California. Then Glenwood Motors beat Berg 7-6 to send them to the losers bracket. There, they eliminated Blinky’s 2-0, Kerr’s 6-4 and Glenwood Motors 2-0. Pitcher Benny Crittenden hurled the two shutouts. Shortstop Vince Peralta sparkled on defense and drove in the deciding runs in some of the close games. Bert Smith hit a 3-run homer to spark the Piledrivers to a 9-4 win in the Championship Game over Little Caesars, who lost their opening round game to Howard’s Furniture and won 8 straight games before being beaten in the final. Bob Auten (11 HRs, 19 RBIs), Tex Collins (7 HRs, 18 RBIs) and Bill Cole (6 HRs, 10 RBIs), Gary LaDue (4 HRs, 10 RBIs), Bob Malicki (5 HRs, 15 RBIs) and Mike Gouin (8 HRs, 17 RBIs) all led Little Caesars back to the final. Championship Run. MVP Bert Smith came up big when it counted once again. He was 15-22 for a .682 average with 7 HRs and 22 RBIs. The winners bracket final between Troy Redmen and St. Patricks was tied 6-6 in the fifth inning when torrential rains came and washed away the rest of the tournament. Troy and St. Pats were awarded Co-Champs and Des Speilhaus of Wisconsin and Fairport Merchants of Rochester third and fourth respectively. Both were alive in the losers bracket. Jefferson County Merchants and 5&10 Tap were awarded 5th and 6th as they were still alive as well, but did not advance as far as the other two teams with one loss. Also, Fairport defeated Jefferson County head-to-head. In the final few games played: Winner’s bracket – Fairport Rochester Merchants defeated Jefferson County Merchants 4-1. Troy Redmen defeated Fairport Rochester Merchants 15-5. St. Patricks K of C defeated Milwaukee 5&10 Tap 10-3. In Loser’s Bracket games; Des Speilhaus eliminated Schumachers 12-4. Jefferson Merchants eliminated Corbin Pepsi Cola.